My wife, Snædís, traveled to Iceland last weekend and was fortunate enough to be able to join a fishing tour with her father and older sister,which took them to the heart of the meditative Icelandic countryside. The bounty was scarce this time around so I decided to cook salmon to honor her attempt of catching one. The recipe proportions are slightly smaller than usual given that only the kids and I were eating. Place the vegetables into an ovenproof dish and mix well together. Heat the oven to 180°C. Pour the garlic oil over the vegetables and season generously. Transfer to an oven and roast for 20 minutes. Stir the vegetables occasionally while the cook. Coat the salmon with maple syrup and place the lemon slices in neat rows on top. 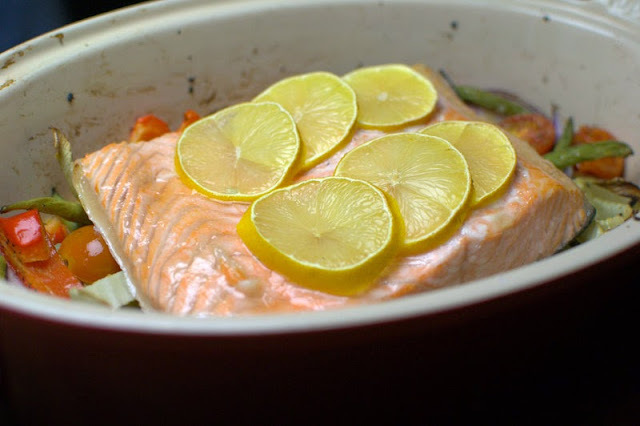 Then put the salmon on top of the vegetables and transfer the lot into the oven and cook for 20-25 minutes, or until the salmon is cooked through. This image is here only because I think it is beautiful. The smell in the kitchen was incredible! Transfer the salmon onto a serving plate. 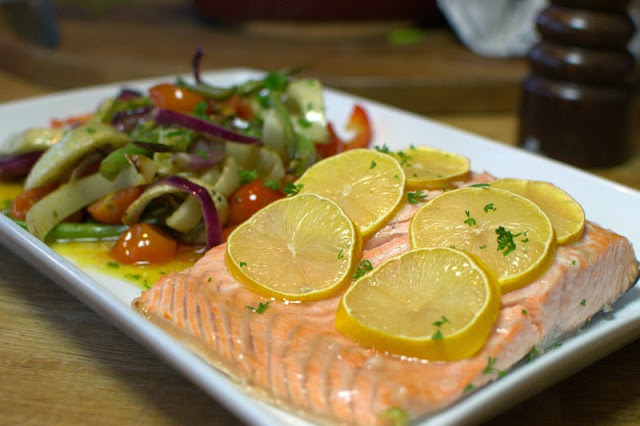 Allow the the vegetable to rest next to the salmon and pour the oil over. Garnish with fresh parsley. The sauce is very simple. Mix together creme fraiche, garlic oil and syrup. Season to taste. Serve with rice and perhaps a nip of white wine. I had this lovely bag-in-box cooling in my fridge. I have tasted this wine before from a bottle but the bag-in-box version was also nice. It is a light chardonnay, with rigorous fruit notes, tad of butter and a lasting aftertaste which paired well with the salmon. It's always time to enjoy! This looks just scrumptious. I have to host the Christmas dinner this year. I think it would be nice to include this dish in the menu. Thank you for sharing.